Towels and bath mats confound many people, even those who are otherwise comfortable with various laundry settings. Something about the combination of clean bodies, water, and a possible stale smell makes these items seem somehow different than the rest of the laundry. Fortunately, like anything else in life, following a few simply tips and tricks can get you back on the road to success. Why Wash Towels and Bath Mats Regularly? Some people wash towels and bath mats after every use, while others wait weeks between launderings. Those who fall into the latter camp have a seemingly logical argument: my body is shower-clean when I touch them, so they can’t possibly get dirty! Yet anyone who has ever smelled a towel that was shoved into a locker or hidden under a bed while still wet knows this simply is not the case. The reality is that every time you towel off, you exfoliate dead skin cells, which can build up on the towel or bath mat over time. In addition, wet fibers are an excellent harbinger of bacteria, mold, and mildew. Washing your towels and bath mats regularly ensures that they are as clean as you are right after your shower. The “every use” camp takes laundering a bit too far. Unless you have a compromised immune system or severe allergies, there is no need to wash towels after every use. Instead, plan on using your towel 3 to 5 times between washings. Note that this is calculated in uses rather than days. If you shower 3 times in one day, your towel is exposed to the same number of dead skin cells and is re-wetted the same number of times as if you shower every other day for 6 days. How often to wash a bath mat depends on how often it is used. In high-use bathrooms that host several showers per day, the bath mat should be washed weekly. In single-occupant bathrooms where the bath mat is used only once per day, it should last for about a month between washings. However, if it is in a kids’ bathroom, where water is regularly splashed on the floor, it should be washed once per week. Rubber-backed bath mats do not stand up well to laundering, so to avoid premature wear, they should be washed only once a month. Either replace the rubber-backed mats in high-use and kids’ bathrooms with something more laundry friendly, or rotate through a collection of different mats. Wash bath mats alone, with other bath mats, or with towels. Do not mix clothes or sheets into the load. Use warm or hot water and plenty of detergent. Rubber-backed bath mats should never go into the dryer, but should be hung to dry. Those without rubber backs are fine in the dryer. Expect the dry cycle to take a long time, especially for thicker mats. Proper towel care begins after each shower. Hang up your towel to dry, straightening and smoothing it rather than allowing it to bunch up. This promotes airflow and minimizes the risk of mold or mildew forming. Never toss a wet towel into a laundry basket unless you are carrying it straight to the washer. Run the bathroom fan for a few minutes after every shower to clear the steam. Wash towels in warm or hot water on a heavy-duty cycle. Use a full cup of detergent and either a commercial wash booster or a cup of vinegar. Tumble dry and remove and fold while warm or, if possible, hang outside in the sunlight to dry. If all of this seems complicated, consider using a laundry service instead. 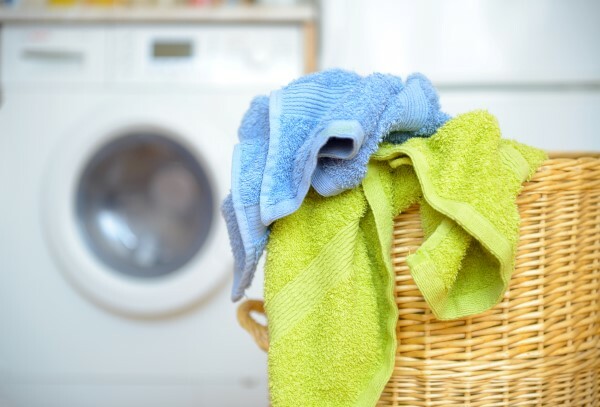 Just hang your towels and bath mats to dry and then toss them in the provided bag, and they will be returned to you clean, fresh, and neatly folded.